The biggest mistake Australia’s Reserve Bank ever made was to push up interest rates to insane heights at the end of the 1980s and keep them there, eventually forcing Australia’s then Treasurer Paul Keating to declare that we were in the recession “we had to have”. Did they know what they were doing? Did they see what was coming? Did anyone – Keating himself perhaps – beg them to stop? Until Unfinished Business to be launched by Keating himself this week, we’ve had no clear answer. As this quasi-biography reveals, in part this has been because Keating doesn’t like ratting on friends. David Love is a legendary economics writer – a former economist at the World Bank and press gallery veteran who has reported politics since the 1950’s, he went on to found and run the economic consultancy Syntec before retiring to seek out people such as Keating in attempt to get at the truth. Keating must have found Love’s questions hard to avoid. Love understands the big picture and also the importance of personalities in economic history, something that lesser economics journalists (such as myself) don’t pay enough attention to. Keating told Love that he was betrayed by Bernie Fraser, his handpicked Reserve Bank Governor. Twice, in fact. Keating appointed his then Treasury Secretary to the top job in the Reserve Bank over the heads of others in September 1989. It was at the time imperative that rates be cut. As Keating tells it, Bernie Fraser also believed that they should be cut, as did most of the members of the Reserve Bank board. Insecure, and feeling his way into the Reserve Bank job, Fraser refused to act on Keating’s pleas. ‘I said to Bernie, “We’ve got to be quick and flexible. This is the time to go into reverse.” Keating says. ‘But there was on the bank board at that time a standout against this. I’ve got the picture of him still fixed in my mind: he wore black suits and looked like a bad priest. I said to Bernie, “Take no notice of him, he has become an old fool”. Keating says Fraser betrayed him a second time in 1994 when Australia was coming out the recession and the headline inflation figure nudged up a few points. Fraser rammed up interest rates by 0.75 percentage points in October, by 1.00 percentage points in October and by 1.00 percentage points in December. They are jumps that seem extraordinary now, and seemed extraordinary then to the trade union leader on the board Bill Kelty. Increasing mortgage payments by 60 per cent just 18 months before an election was certain to kill the Keating government. Keating begged him to bring them down. The result was the end of the Keating government and also an end to an extraordinary unprecedented economic revolution. Keating began it by floating the dollar, cutting tariffs and using the Accord and enterprise bargaining to limit real wage growth to productivity growth. None of these measures was part of the Labor tradition. Each was part of something bigger. He was in the process of continuing the revolution by setting up what he called he his “golden circle” - rising compulsory super contributions, leading to rising household savings, leading to a rising stock of capital, leading to rising international strength, leading to stable interest rates, leading to rising household net wealth. His only consolation on leaving office was his belief that his successor John Howard had promised to complete the circle by lifting superannuation contributions from 9 per cent to 12 per cent to 15 per cent in accordance with the Keating timetable. Love’s book is about a giant – a “rare bird, who knew he was rare, as all rare birds do” – who was torn down by lesser people who failed to grasp the importance of his vision. The public service and the Reserve Bank “had no ill will towards us,” Keating says. It is also about Keating’s untutored gift for grasping the importance of something, fitting things together, and winning people over. It quotes Ted Evans, the present chairman of Westpac, later the head of the Treasury and at the time a senior Treasury officer, describing how Keating worked within in days of taking office. Evans had warned him the budget deficit had to come down. Keating said he needed an argument to put to the Labor caucus. Keating wanted Howard to lift super contributions to 15 per cent, not for his own place in history but because he believed it was vital. I disagree with Love (and Keating) about the merits of compulsory 15 per cent superannuation, and I don’t think he makes the case for it persuasively. But he does come close to getting inside Keating’s head, something earlier biographers have failed to do and the wider population has lost interest in doing. One of his chapters is called “The Process of Forgetting”. Unfinished Business will help us remember. 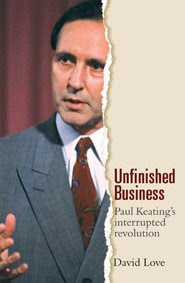 Paul Keating will launch Unfinished Business at the State Library of NSW on Wednesday August 6. It will be launched in Canberra on Wednesday August 13 at the ANU Co-op Bookshop. 5pm for 5.30. Is this sure-fire way of making $50? "Tell the truth about tariffs"
Will the banks pass on the rate cut in full? Q&A: Can the banks afford to cut rates right now? It's on alright. The Reserve Bank says so. Will the Olympics boost Beijing's economy? 100,000 to be thrown out of work? Australia's job figures: "a waste of space"
Will The Reserve Bank move today? Who owns the land on which Canbera is built?